For Christmas, Rich bought me a whole bunch of Lush goodies. Yay! I love Lush so, so much! I'm fully aware of the terrible photos here- I was so anxious to get started on using this stuff that I just couldn't wait for decent light (and my pretty bedding!). Let me start by saying: This is really glittery. Touch it for a second and the silver shimmer will be all over you. It might be a little bit off-putting for some but stick with it. It's lovely! 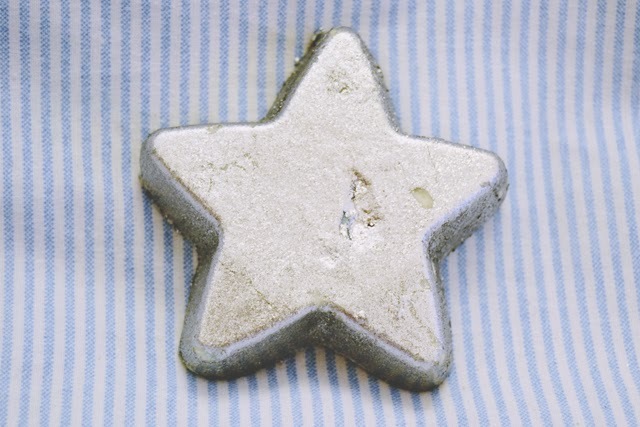 It's part of the Christmas range which I don't really understand because although it's star-shaped and silver, that's where the festive associations end. The scent is a very strong lime which I loved, although Rich thought it smelled like Fairy Liquid! It has organic shea butter inside so it makes the bath all creamy and leaves your skin really smooth. The glitter made my skin shimmery so make sure you don't use it before a big day! It also made my bath water bright blue, so I felt like I was swimming in the Caribbean! Another summery one! What's the deal, Lush? I thought Cinders would be really Christmassy- It's cinnamon and orange, after all, but all I got was a very strong citrus scent. It's nice and all, just not very festive. I thought the popping candy on the top would be a lot more exciting but actually it just kind of fizzes. It also turns the bath water a rather unpleasant yellow colour. As my mum said "It looks like somebody's weed in the bath". I'm not going to lie: I only wanted this little fella because he's so darn cute! However, it turns out that he's a nice little product too. I found the subtle orange flower and mandarin scent to be really relaxing and comforting. As with all bubble bars, I crumbled a little bit of him into the running bath and he produced loads of lovely scented bubbles. I'm not sure how I'm ever going to be able to crumble his face though! My mum bought me this bubble bar on a whim when she was getting me a Christmas present in Lush. I'm glad she did: It's lovely! My exact comment when I got in the bath was "Mmm, springy freshness!" 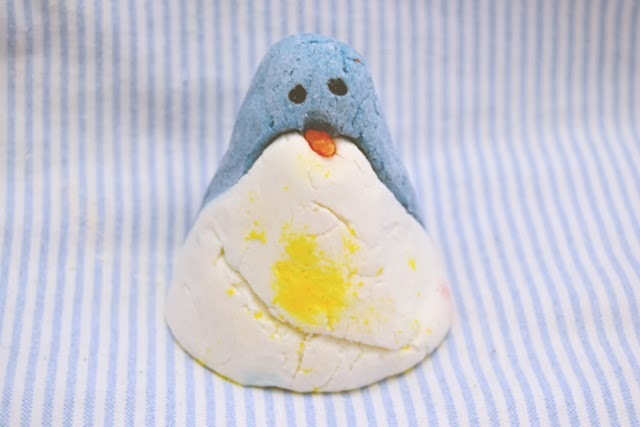 It's made with mandarin and orange blossom oils, similar to Christmas Penguin, but the scent is a lot more noticeable. It has a very fresh, uplifting fragrance which clings to the skin afterwards. 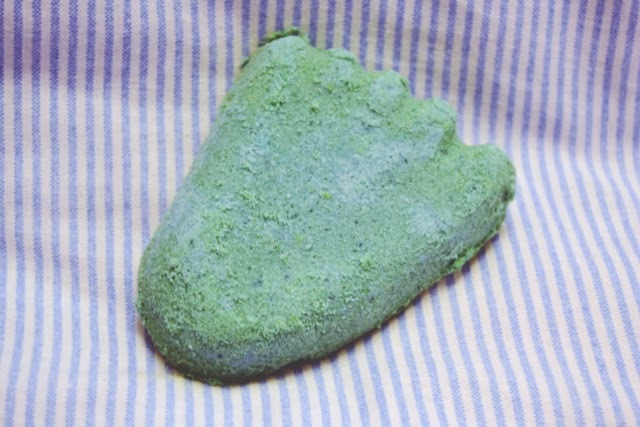 It also seems to produce a lot more bubbles than other bubble bars. I was so excited about trying this one! I love that it's shaped like a UFO and I love the red glitter. Turns out, it's amazing! 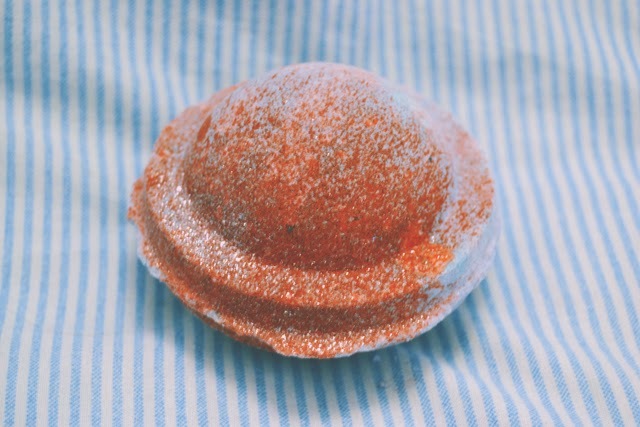 It's the fizziest of all the bath ballistics I've tried, and has the fun addition of popping candy so it sounds like you've tipped a sachet of Pop Rocks in the bathwater. 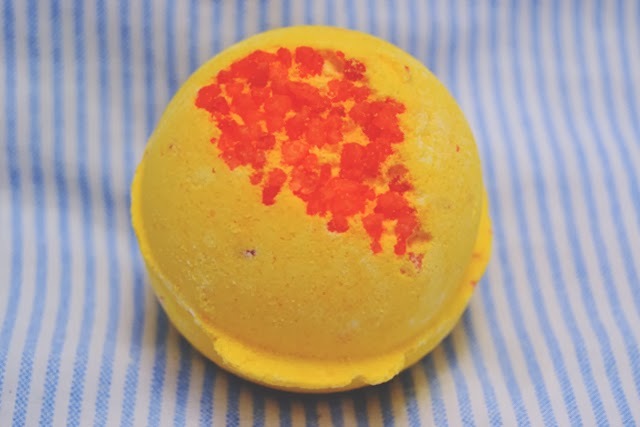 The scent is really strong and it smells exactly like Parma Violets- a really sharp citrus. Space Girl turns the bath water a bright indigo with swirls of red sparkles. It's definitely my new favourite! This is part of the retro collection, which I don't think is available anymore. Let me tell you, this thing is massive! It's bigger than my hand! Each side has a different scent so you can use one separately, or mix and match. We cut each side into half so we ended up with four uses. 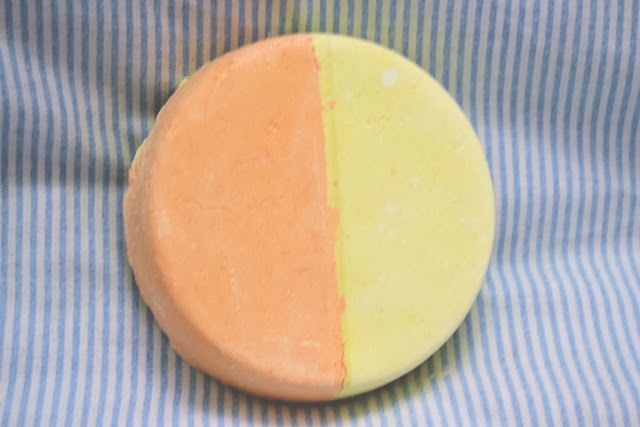 Both sides have a fruity citrus scent: The yellow is grapefruit and the orange is mandarin. Supposedly, the mandarin is the same scent as Christmas Penguin, but it definitely smelled a lot stronger in Happy Pill. It's a bath ballistic, so it fizzes nicely in the bath but it does create a yellowy-orangey colour like Cinders. I have so many problems with my feet, particularly my heels, so I'm always on the lookout for a good foot product. I thought a foot scrub would be perfect, especially a nicely-scented one. Unfortunately, Stepping Stone is not that great. It's very, very brittle. Not in the way that most Lush products are, but in a way that completely crumbles away when you pick it up. It smells amazing- It's got a fresh lemongrass scent. However, it's really confusing to use. I've Googled it and nobody really seems sure on the best way to use it. I think I'm going to experiment to try the best way but it shouldn't be this complicated! So there we go, another Lush haul! Apologies for the photos- I promise I won't be so impatient next time (ha!). In fact, as I type this, I've just finished photographing my January sales Lush haul, so there'll be another review coming in a couple of weeks! Seriously, my bathroom is like a Lush stock cupboard! found that I only needed a bit to get a decent amount of bubbles, I reckon I will get about five baths from it. I like the look of 'Pop in the Bath'. This is what I love so much about the bubble bars! I'm so jealous I don't have a bath I need that fizzy space girl bath bomb in my life! Maybe you're meant to mix a bit of stepping stone with water and rub it in like a scrub? Oh no! I couldn't live without my bath! I heard your supposed to break pieces off of the stepping stone, and mix with water and use it like that, just little by little. I love Lush! I would have had to get the penguin too! Way too cute! I think I'd have to save him too! My first ever bath pearl was a dolphin (I was 7) and I just couldn't put it in my bath...I've still got it at 22! Oh dear.. I remember those bath pearls! I had a dolphin one too haha! I can't wait to buy the Valentine's stuff! I seriously don't use enough Lush products! I read all the reviews and just want to have them all. Damn sensitive skin! Oh no, that's such a shame! Have you asked the people in the shop for advice on what will be safe to use? They're very helpful! Wow, you must have a LOT of baths! Have you ever tried the massage bars? They're my favourite, nice and moisturising and smell delish! I have a bath every day. I'm not much of a shower girl! 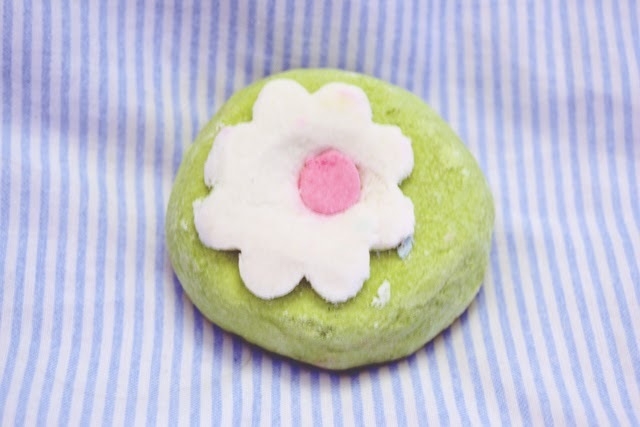 I triedtheSnow Fairy massage bar but I must try some others! You definitely need some more Lush stuff haha! Space Girl is so amazing! Ah such a lovely review, wish I'd tried the little Christmas penguin he is adorable! Definitely need to try pop in the bath as well! 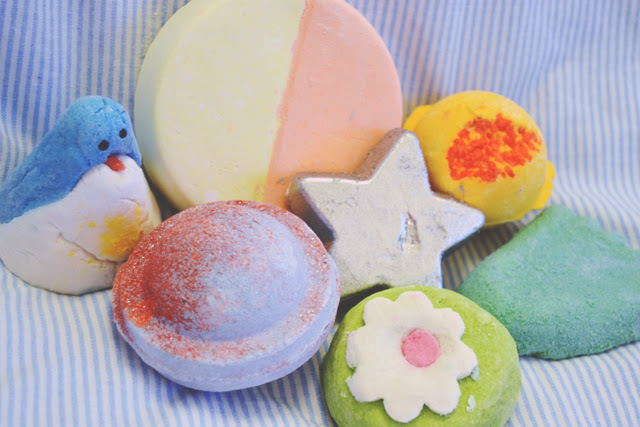 I've just started a blog and done a mini LUSH haul so maybe you could check it out :) not many posts up at the moment but there will be very soon! !